In a major breakthrough, federal investigators have recovered the mangled remains of one of the bombs planted along the route of the Boston Marathon Monday, according to two counter-terrorism officials briefed on the case. The officials told ABC News the remains show a medium-sized pressure cooker, packed with wires, a circuit board, nails and ball bearings. Michael Sullivan, former director of the ATF, told ABC News such clues are "critically important" to the investigation. "It could be that one piece that could show them how that device detonated and that might be the only piece that's left," he said. "You can imagine a blast like that... You're not going to be able to collect and reassemble the bomb itself, but you'll be able to take some of the component parts... All those clues will be critically important." Rep. Dutch Ruppersberger (D-Maryland), ranking minority member of the House Intelligence Committee, told ABC News the bomb analysis could lead to a break for law enforcement. "Right now, they're finding out what kind of bomb it was. They'll trace that and get information," he said. ""Whoever did it, we're going to find them." Earlier today doctors caring for the 170-plus victims of the deadly bombing reported they have been pulling nails or nail-like objects from those struck by the twin explosions – likely shrapnel from inside the bombs. "Nails or sharp objects," Dr. George Velmahos, chief of trauma at Massachusetts General Hospital, said at a press conference. "Can't say for certainty, but that's what they look like. [They're] numerous… 10, 20, 30, 40 in their bodies, maybe more." A spokesperson for Brigham and Women's Hospital, another medical center caring for the wounded, reported similar injuries, apparently caused by carpenter nails and small ball bearings. Velmahos said he believes that shrapnel specifically came from the bomb itself, which, based on the number of lower extremity injuries, was likely planted low to the ground. Others were hurt by environmental shrapnel -- objects close to the blast -- and still more were injured just by the blast of air that slammed them against walls. Three people were killed and more than 170 others were injured, 17 of them critically, in a pair of explosions near the finish line of the Boston Marathon Monday afternoon. No suspects have been identified. Minutes before Velmahose's comments, law enforcement officials held their own press conference where they revealed that the marathon route had been swept twice by bomb detection units and declared clear. "[But] people can come and go and bring items in and out" after the races started, Boston Police Commissioner Ed Davis said. ATF special agent in charge Gene Marquez also said the only devices involved in the bombing were the two that detonated and there were no additional threats. Davis and several other local and federal officials implored the public to provide any evidence, including pictures, videos or observations, they may have to the authorities by calling the FBI Tipline at 1-800-CALL-FBI. FBI special agent in charge Richard DesLauriers said investigators had already received "voluminous" tips and were "logically" following up on leads. Today on "Good Morning America," former White House counter-terrorism advisor and current ABC News consultant Richard Clarke said he believed this would be a case that would be broken either very quickly or one that could require a much larger and longer forensic effort. Officials today appeared to be preparing the public for the latter. "This is the most complex crime scene we've ever dealt with in the history of our department," Davis said, noting that the FBI is the lead investigating agency. "Please be patient with us." "I ask for your patience and your understanding as we pursue leads and gather evidence to get to the bottom of who did this and why," U.S. Attorney Carmen Ortiz said. Late Monday a tip about possible explosives led federal agents to search an apartment on the fifth floor of a building in the Boston suburb of Revere, but agents later told residents there was nothing to worry about and law enforcement sources said later that part of the investigation was unlikely to be significant. The quick and overwhelming law enforcement response underscored the urgency of the FBI's effort to track and stop the people responsible. Monday FBI agents also went to a local hospital to question a 20-year-old Saudi college student who was injured in the blast, but authorities stressed that he is not considered a suspect. Experts said the most important clues could come from several videos from the race that caught the blasts in real time as well as the explosions themselves. Authorities said the white smoke seen shortly after one of the detonations indicates small bombs with a simple, low-velocity, explosive mixture -- not military grade. "[The attackers] may not have the resources as we have seen in other bomb attacks, but they knew how to make the bomb go BOOM," said Nick Casale, security expert and former NYPD officer. Experts also pointed to large pieces of metal, seen flying through the air in one of the videos, which suggests the bomb may have been concealed in a mail box or trash barrel. However police said today there's no hard evidence they were hidden in trash cans. The limited damage to nearby buildings told experts the bomb may have failed to fully function as designed. 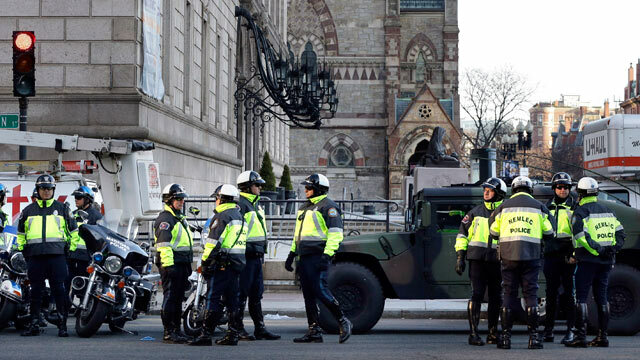 If it did somehow malfunction, former NYPD bomb squad member Kevin Barry said Boston was potentially saved from "much more catastrophic injury and possibly more death." ABC News' Lee Ferran, Angela M. Hill, Cindy Galli and Matthew Mosk contributed to this report. CLICK HERE to return to The Investigative Unit homepage.